This was forwarded from Flatbush Gardener, so I couldn't resist posting it even though it's slightly more than a hop, skip, and jump away. Besides, there is free coffee if you bring your own mug. Perhaps it will inspire some Park(ing) in Sunset Park. Visit on Friday and call it research for a Sunset park-in. Library, at the corner of Cortelyou and Argyle Roads, in the Flatbush neighborhood of Brooklyn, is one of 50+ sites around New York City participating in Park(ing) Day, an international event. The park will include art activities and exhibitions for both children and adults. Two sustainable craft business based in the NYC-area, Garbage of Eden Design and RePlayGround will teach free creative workshops on fashioning fun stuff out of garbage. We invite you to bring your favorite cereal box or designed scrap paper to personalize your crafts. Jewelry made from plastic bags and yogurt containers as well as kits to make projects from scrap will be on display. Come marvel at worms turning food scraps into compost, and charge your cell phone with solar power all while listening to music and relaxing with good neighbors and new friends on a patch of grass! Be sure to fill up at our BYO Mug Coffee Station, courtesy of Vox Pop Café. Enjoy a snack from the Flatbush Food Coop, or sample a dessert from Visions Restaurant & Bar. Enter the raffle for a chance to win a Coop Food Gift Basket or Visions Gift Certificate. Plus, beginning at 11:00 AM, Ronny Wasserstrom will be entertaining the kids with his special trick puppets, including the juggling egg puppet! So stop by and bring your own coffee mug and you will never look at a parking spot the same way again! While those of us who live within walking distance of Sunset Park might think that our neighborhood enjoys sufficient green space, the truth is that Sunset Park (the 'hood) is "open space challenged." We're on for helping/collaborating to duplicate this concept throughout the community. Drop us a line (friendsofsunsetpark@yahoo.com) and we'll be happy to lend our support. Thank you, BViB for your "Best Practices" reporting. 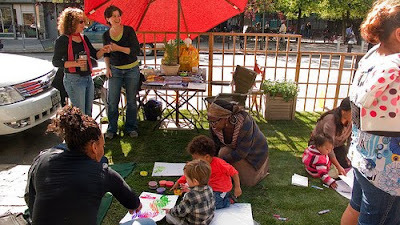 May be next year Sunset Park can have its own Sunset Park(ing) Day. What neighborhood r u guys from. Sunset Park participated in Parking Day last year. The guy that did it was located right in front of the supermarket on 44th & 5th Ave. google it.